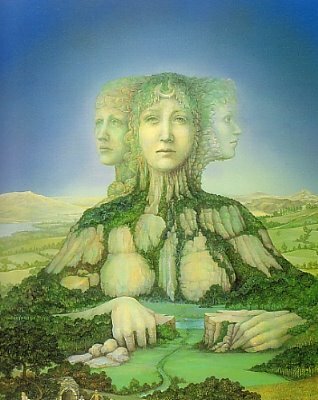 The whole August is dedicated to Taillte, the Fostermother of Lugh, Sun God. Not much is known of her, though. Tailtiu (Tailltiu, Tailte, Teia Tephi) is the name of a presumed goddess from Irish mythology and the town in County Meath that was named after her. According to the Book of Invasions, Tailtiu was the daughter of the king of Spain and the wife of Eochaid mac Eirc, last Fir Bolg High King of Ireland, who named his capital after her (now Teltown, between Navan and Kells). She survived the invasion of the Tuatha De Danann and became the nurse of Lug. Lug established a festival, Ãenach Tailteann in her honour, which continued to be celebrated as late as the 18th century. She died after clearing the plain of Breg in County Meath, and Lug instituted funeral games in her honour at the festival of Lughnasadh. What to eat on Lammas and the rest of the August then? - this is the hottest time of the year, and meat gets easily bad. But if you have to have meat, try poultry. As rooster is Lugh's bird, you can eat chicken. What is not to be forgotten from the table at any time during Lammas is bread. Also other food made of or with grain is good. How many different sorts of cereals did you know of? Wheat, corn, barley, oat, rye, rice... any more? Just search (recipes - browse - search) with "beer" "kugel" "bread" or "blueberries", "blackberries" or just "berries"
Combine the blueberries, jam, brandy and maple syrup in a small saucepan. Place over medium heat and cook, stirring occasionally, until blueberries start to pop, about 10 minutes. Remove from heat and stir in lemon juice. Keep warm. In a mixing bowl, whisk the beer, egg white, honey, and vanilla. Stir in the pancake mix and blueberries. Heat a nonstick griddle or skillet over medium heat. Lightly spray the skillet with nonstick cooking spray. Working in batches, pour in about 1/4 cup of batter for each pancake. Cook until browned on the bottom and bubbles begin to form on the top. Turn the pancakes and cook until browned on the bottom. Serve immediately, with the syrup. This recipe is from Julie R. from the Pacific Northwest. "This is from 14th Century England. Use fresh herbs." Makes about 3 dozen 2-1/2" fritters. Dissolve yeast in 1/2 cup water. Add salt to flour; when yeast is foamy, add yeast and rest of flour to water. Let sit while you chop and ground the herbs. Divide batter in 4 portions. Add one kind of herb to each portion, (or add four times as much of any one of the herbs to the whole batter). Fry in 1/4" deep oil by the 1/2 tablespoonful. Often used as a beverage this makes a nice salad dressing. Place berries in an earthenware vessel. Let stand three days (this will draw out the juice from the berries). To strain place cheesecloth over a bowl, pour in the mixture. Measure the amount of liquid you have (discard berries). You will need 1 pound of sugar for every pint of liquid. In a pan boil vinegar with sugar gently for 5 minutes. Use fresh herbs any will do but these are recommended. Place a spring of rosemary down the center of the trout. Chop the remaining herbs and blend them into the butter along with the salt and pepper. Coat the trout on both sides with the herbed butter. Barbecue or bake fish until cooked through and the flesh flakes easily. Every now and then brush the trout with the butter. "This is from 15th Century Italy." Boil turnips about 30 minutes. Layer turnips and cheese in a 9" x 5" baking dish. Sprinkle each layer with spices and dot with little butter. If you don't have citron available use a combination orange and lemon peels. Add honey, citron, sugar, and anise seeds. Turn the batter into a well-greased 9 x 5 x 3-inch loaf pan. This recipe yields one loaf of bread, and improves in taste if allowed to stand for 24 hours. Make the pudding: Preheat oven to 325°F. Combine baking soda, baking powder, cinnamon and salt, set aside. Beat in eggs, vanilla, and molasses until fluffy. Stir in figs, lemon zest and buttermilk. Pour into baking pan and bake about 1 hour or until done. Make the sauce: Cream butter and sugar until light. Stir in the red wine, lemon zest and nutmeg. Just before serving, beat sauce over hot water in double boiler. Heat thoroughly. Serve over with hot pudding.